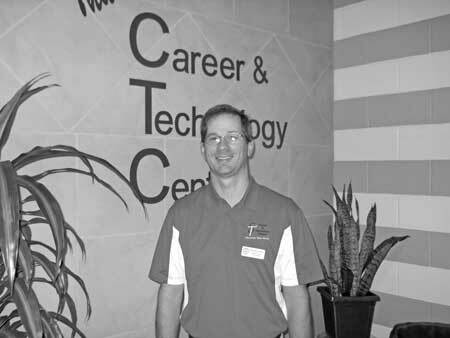 Strom Thurmond Career and Technology Center’s new Project Lead the Way (PLTW – Engineering) teacher is Scott Johnson. Mr. Johnson attended the Intro to Engineering course training in July at the University of South Carolina. “The PLTW curriculum and training are great” said Johnson. PLTW is the nation’s leading provider of Pre-Engineering programs. PLTW’s world class, activity, project, and problem based curriculum and high quality teacher professional development model, combined with an engaged network of educators and corporate partners, help students develop the skills needed to succeed in our global economy. Nationally, PLTW has outstanding partnerships with leading corporations and philanthropic organizations including Chevron, Lockheed Martin, the Kern Family Foundation, Autodesk, 3M, Amgen, Bemis Company, Cargill, the Dart Foundation, General Motors, John Deer & Company, Eli Lilly, the Louis Calder Foundation, Pentair, Rockwell Automation, and SunPower. One Response to "Johnson Joins STCTC Team as Engineering Teacher"